ILEAS is honored to recognize The Kenilworth Police Department for their participation and completion of the Agency Preparedness Program. 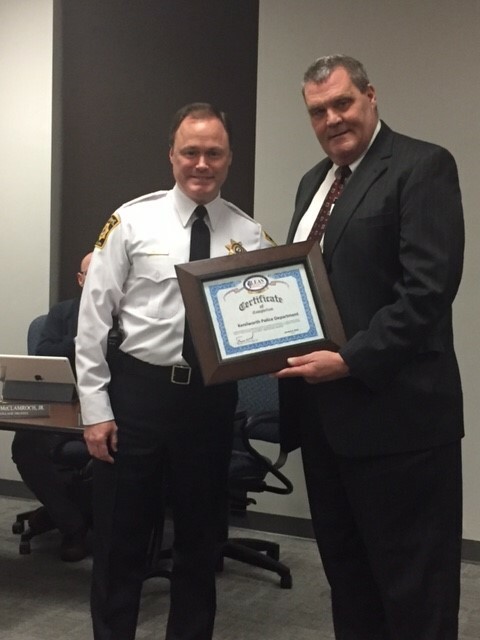 On 22 January 2018, Chief Dave Miller was presented the ILEAS Agency Preparedness Award at the Kenilworth Village Board Meeting by ILEAS Regional Planning Coordinator, Jim Hutton. Executive Director Jim Page and the entire ILEAS staff commend Chief Miller, Sergeant Padilla and the men and women of the Kenilworth Police Department for their efforts in successfully completing all components of the Program. ILEAS believes the Agency Preparedness Program sets a good foundation for the challenge of readiness. ILEAS hopes to improve and expand upon the Program annually by adding relevant objectives to help your agency stay current and maintain preparedness for years to come.